The e-learning, e-Books are the backbone of the educational infrastructure. 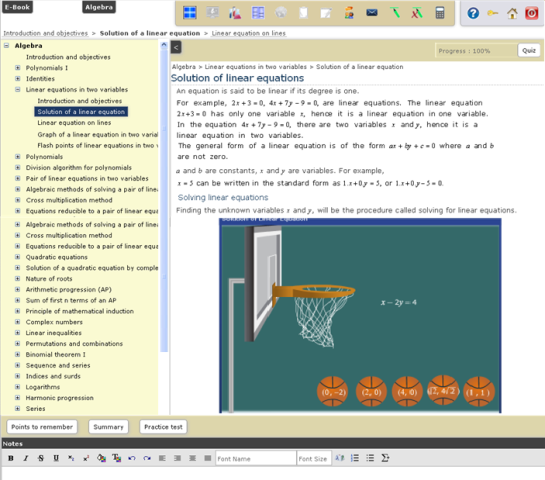 For each course within a program, the e-Books contains all theoretical information on the topic including graphs, documents, media files, and more. e-Books contain quizzes, practice tests, summative assessments, and exam tips for each subtopic in the subject area. There is also a summary and the important points to remember (Exam Tips) clearly listed for the students The online study material establishes uniform learning platform across the board affiliated schools and across the nook and corner of India as well abroad. The layout of E-Book is uniform for all subjects and for all grades. Each session includes a Objective, Introduction, audio visual animations using computer voices and images, Summary, Points to remember and finally an assessment in terms of practice test at end of each session. The practice test is used for feedback analysis and are instantaneously evaluated with correct answers for wrong choices. The E-book do have capability to make it more interactive to the students with simple control buttons similar to video players like pause, play, mute, rewind capabilities. This permits the teaching staff to deliver the E-Learning content in a more interesting, absorbing way to understand with enormous flexibility to handle class in teachers own way of imparting the knowledge. The computer animated voice tutor imparts the knowledge at all times at same level of rhythm without signs of human fatigue which could probably occur in non pleasant class hours to students. By this if the children even if has missed a few lines in understanding a concept in a live class session, fails to absorb the whole content in that session. However the student could benefit in understanding the concept when he is in absorptive mental state of learning, by listening to the missed sections of animated E-Learning once again thereby arousing interest to understanding subject as well improvement in academic performance. This could be made possible by our unique technology of online delivery of class sessions any time anywhere. The E-Book contents voice over is timed in such a way that it matches with the running texts which explains the concept for that specific video animated sub topic . This voice over could be muted to enable silent studies during late hours if desired to do so.